The SEAFORTH SLICKER gives golfers ultimate protection for their clubs and golf bag. Using the same patented technology as the original Seaforth Rain Hood, the Seaforth Slicker is an extended version of the hood that covers the whole golf bag. 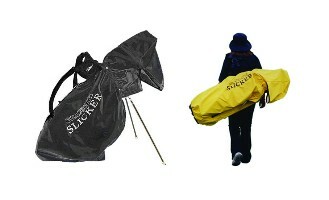 The Slicker splits down the front allowing the golfer to simply wrap the Slicker around the bag – quickly and easily! A combination of snaps, elastic, and Velcro ensure a snug fit on almost every golf bag. Carry straps can be used by pulling them through the “T” split at the back of the Slicker. The "T" can remain closed if the bag is on a trolley or power cart. The SLICKER works great on stand bags. Simply attach the interior Velcro extensions that go under the bag’s legs to keep the Slicker from riding up. Extend the legs and then use the Velcro tabs down the front to close off the bottom part of the Slicker. The elasticized bottom protects the bag from rain on windy days. The SEAFORTH SLICKER gives golfers the quality they have come to expect from Seaforth Rain Gear. The flexible, lightweight fabric can be rolled up to fit in the golf bag pouch - taking up about the same amount of room as a jacket. Two New Features! !- A fabric hook to hang the Seaforth Slicker so it can drip dry after a rainy round and a luggage style I.D. tag so you can identify your Slicker after all your golfing buddies get one too! On Tour Touring golf professionals use the Seaforth Golf Bag Rain Cover/Slicker than any other golf bag rain cover. It is not possible to list all the names of the professionals but the Seaforth Golf Bag Rain Cover/Slicker is #1 on all major golf tours according to the Darrell Survey, the most respected name in recording golf marketing statistics. The Seaforth Golf Bag Rain Cover/Slicker is used by the top players on the PGA, LPGA, Nationwide, and Champions Tours. It is also the choice of the best players on the European Tours and the Canadian Tour. The Seaforth Golf Bag Rain Cover/Slicker was chosen by the last five European Ryder Cup Teams and the last six US and European Solheim Cup teams. It is now such a regular part of the pros’ and golf caddies’ equipment that many well known golf equipment companies like Callaway, Titleist, Cleveland, TaylorMade & Bridgestone, now include the Seaforth Golf Bag Rain Cover/Slicker with the golf pro’s golf bag.